My granddaughter is outgrowing the Santa Letter so I triedt he Nice certificate this year. Of course she wanted on the Naughty List! ?? It'd been better if mailed from you instead of me, I think. Our granddaughter loved this getting this item/ I would highly recommend this item to family and friends. I purchased 3 of these for my younger grandchildren.....Big Hit! 1st Time Purchasing These, I always purchase the Santa Letters every year decided to try these instead they loved the Certificates! Thank You Again Miles Kimball! I would definitely buy the certificates again. 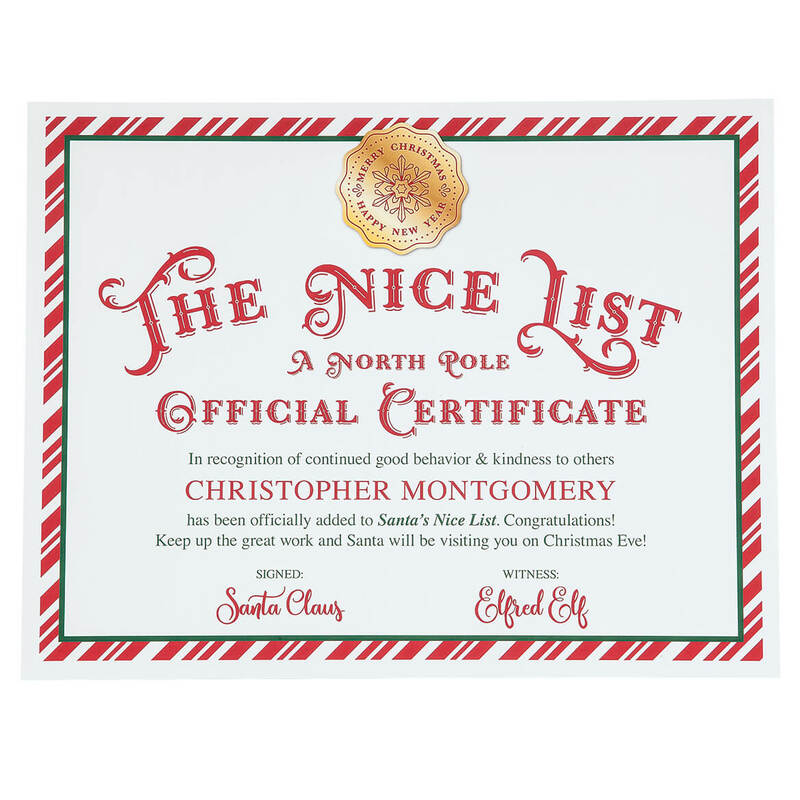 I ordered the Santa's Nice List Certificate for several young children in my extended family. Their parents said the children were delighted and very excited to receive their certificates. My son absolutely loved this! Great for children to receive in the mail. My granddaughter was very surprised and tickled to get this from Santa, and the fact she a made the nice list. My grandson loves it he trying to be very good to stay on list. He said I told you I was good, I can't wait to see when the letter from Santa comes. What a great way to help with the anticipation of Christmas for children. A gift for a friend. Not disappointed at all. Bought a frame at the dollar store. The certificates are beautiful! The children and parents love them. Even Owen's Kindergarten teacher recognized this in him. At Thanksgiving time she sent a note to him saying she was thankful for his kind heart and hard work. I have 4 & 6 year old great granddaughters and I think they would enjoy this more than a letter from Santa. My granddaughter is so thankful and thoughtful she loves giving and helping others especially around this time of the year. I want my nephew and niece to be excited knowing that their names were placed on Santa's Nice List. They will be overjoyed when I bring them the certificate and I tell them that Santa sent it to me so this way he knew that I would definitely bring it to them. I also order Santa's letter for both of them which is mailed directly to them. Every child wants to make sure their on Santa's good list. Something new and cute. Boys will get a kick out of the certificate! I chose this card because the children are a little older and this look better for them that the other cards, The other cards seemed to be for younger children. The boys are older. The letters available were not different enough. Grandchild getting older, needed something different then the usual "Santa Letter". Hope to see more choices in the future. Cute ideas for the grandkids that have moved out of state. Little Girls should really love items. we are hoping this encourages good behavior...you know who is watching! We chose this because our granddaughter is getting a little too old for letters from Santa but her four year old brother still loves getting a letter in the mail. I thought this would cover both for now. I like this since we've been sending letters for several years and this is a new idea that they won't expect. My nieces will be so excited they made the "nice list"
Does it come in a personalized envelop as well? Or just a regular envelop? BEST ANSWER: Thank you for your question. Unfortunately no the envelope will not be personalized. We hope this information will be of help to you.